Glenmorangie’s head of maturing whisky stocks cut his teeth at Diageo’s Islay distilleries and the Port Ellen maltings before graduating to become Dr Bill Lumsden’s understudy. He tells Becky Paskin about his natural knack for identifying aromas, whisky myth frustrations, and the company’s secret ‘blending book’. ‘I knew I had a decent sense of smell when I worked in Port Ellen maltings and at Diageo’s distilleries [Oban, Lagavulin, Caol Ila]. When you work as a maltster, a lot of quality control is done by measuring water content and temperature, but it’s also done on the nose as well. If the malt smelled like wet cardboard or corked wine, you knew that drum was ruined – it was over-wet and too warm. If you smell strawberry yoghurt, this synthetic strawberry note, that was a great sign. That meant you had the right kind of speed of germination happening in the drums. ‘I used to always talk about that at Burghead, my very first job with Diageo. I used to say: “I can smell strawberry yoghurt,” and people used to look at me funny. Eventually I found a book and some commissioned posters by Diageo, and the smells you wanted to look for included strawberry yoghurt, and also watermelon or grapefruit, and I used to pick those up as well. ‘I sometimes have a wry smile when I see so many people who knew at four years old that they wanted to be a whisky maker, and that’s great if they did, but when I was four years old I wanted to be Paul McStay, who played for Celtic. I didn’t want to be a footballer; I wanted to be Paul McStay. ‘Dr Bill’s [Lumsden, director of distilling, whisky creation and whisky stocks, and McCarron’s mentor] way of teaching me to take over from him is very much “you do it, and when you need my help, I’ll come and help”. Ardbeg An Oa was my project, but I made it under the direction of Bill. He was able to show me the intricacies, just little bits of finesse, and advice on how he would change it, and then of course everyone in the whisky tasting team tastes and noses and comments on everything. ‘With An Oa, we wanted to make an Ardbeg that’s still intense, still smoky and still an Islay, but maybe more rounded, more accessible. That was the brief that Bill came up with then he tasked me with doing it. I did over 1,000 bench blends throughout and I eventually whittled it down to about four rough ideas. I got focused in on two of the four, then I started to combine the two of them together and I knew I was getting close. ‘I was so nervous about it when it came out. I’ve been watching comments online more than I should. There were a lot of people going: “Oh for God’s sake, here we go. Ardbeg’s going to do something rubbish and just ruin the brand, or bring something out that’s not ready,” but there are a lot of people saying they’ve tasted it now and it does belong in the range. ‘I wouldn’t say seeing negative comments frustrates me – you want to see a real range of opinions. But there are some myths that are perpetuated by whisky makers and by marketing departments and by ambassadors that drive me insane. ‘I had a guy who was a huge Ardbeg fan and he told me he never drank Corryvreckan because it was chill-filtered [it’s not], and chill-filtration strips out the flavour. ‘There are so many reasons why it’s not chill-filtered, but there is so much myth spread about whiskies that are chill-filtered and it’s not fair. It’s such a hard category – there are so many bloody hard things to learn about it. So stuff like that is frustrating when people have been told something and the basic chemistry of it or the logic is jumbled up. ‘It becomes really difficult. Every single thing has to be explained in such detail just to tell people what your argument is. So sometimes when people have to tell a message to a big group and they can only use a few sentences, people start to attach stuff and the logic gets lost and these kind of myths arise. It’s almost like people take things as an absolute definite, as opposed to sometimes it’s the case and sometimes it’s not. ‘There’s so much stuff in whisky that we will never ever know, because there are too many variables. And at the same time, I don’t really care that I don’t know. I don’t care that I don’t know why Ardbeg 10 is so light when it’s spent 10 years in American oak casks. But I just love the fact that it is because it tastes amazing. I don’t need to understand every single thing, just the things that keep it relatively consistent and keep it tasting amazing. ‘We’ve good theories and beliefs in what causes certain things, but we’ll never know it all. I think that’s important. If we ever got to the stage where we knew every single thing that happened, some of the magic of taking a sample out of a cask of whisky and thinking: “Geez, this isn’t how we expected it to be, but it’s amazing” would be gone. So I’m glad it’s impossible to do it. You can understand some of the key stuff, but there’s also this little bit of art and beautiful randomness that goes into making whisky. ‘We’ve got some new stuff coming next year, and a couple of wee interesting projects. It’s hilarious, we make a brand new whisky and it gets well-received, but then you can’t forget you have to make stuff for 2019. What’s the next big new thing that you are going to do, and what about 2020? It’s never-ending. ‘We have a couple of different ways [to track the projects]. We have a thing we call “the book”, which looks like a colouring-in book. It’s lots of random thoughts scribbled down, just free form things we’re working on, ideas that we have. I had a couple of ideas I came up with while I was cooking the other day, so they all get scribbled down. Some things end up bouncing us onto a different idea altogether. There’s a structure in there somewhere; I’m just not sure it’s written down or legible, but it seems to work. ‘You don’t want the world of whisky creation to be completely formal and proceduralised. That would be the end of it. At the risk of sounding over-the-top and dramatic, that would be it. We’d be dead in the water if we were to get too organised. ‘The reopening of Port Ellen is great; I hope it’s done well. There are a lot of people on that island and not that many jobs, so new distilleries coming to that island, new jobs, new reasons for tourists to go there, there’s so many positives about it. I would have been running it if I was still there, but I’m still happy where I am. The new NAS single malt is the first permanent addition since Corryvreckan in 2009. Looking into the past, present and future of the Highland distillery, founded in 1843. 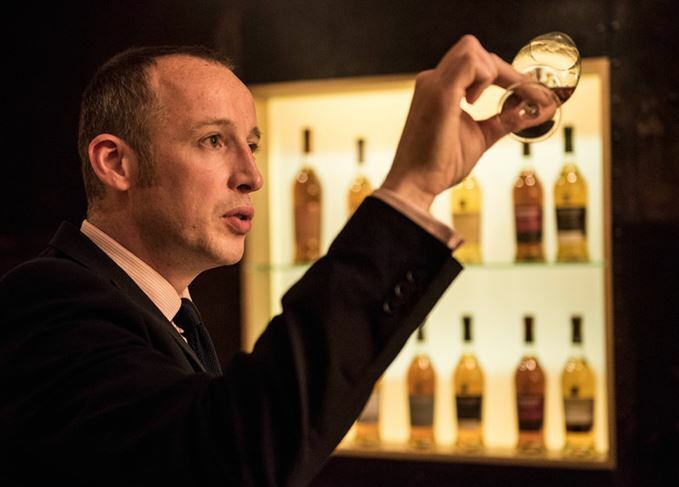 Glenmorangie’s restless experimenter on innovation, LVMH and creating a new whisky in 24 hours. Our amateur Whisky Virgin is introduced to Scotch through a formative Islay experience.